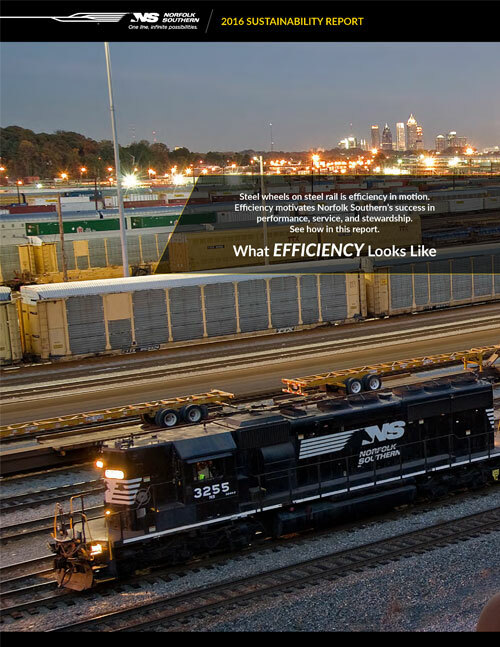 Thanks for visiting Norfolk Southern’s 2016 Sustainability Report and for your interest in learning more about what efficiency looks like at our railroad. Efficiently moving freight trains across our 22-state network is a cornerstone of sustainability at Norfolk Southern. It’s about turning challenges into daily opportunities – keeping our people and communities safe, providing unequalled customer service, and being a good steward of the resources that contribute to our success as a business enterprise. Providing reliable, cost-efficient, and environmentally friendly rail service ensures that we remain a vital link in the nation’s freight transportation network for years to come, efficiently moving the goods that keep our economy moving. In the nine years since Norfolk Southern adopted a formal sustainability program – we were the first large U.S. railroad to appoint a corporate sustainability officer – we have embedded sustainable practices into our corporate strategy. We recognize that sustainability is not something you just bolt on: To be most impactful, sustainability has to be entwined in daily operations in ways that advance our business goals and honor our environmental and social commitments as a responsible corporate citizen. Examples of how we achieve that balance are found in this report. In 2015, for instance, we rolled out a new class of low-emission Eco locomotives, recycling older frames to save on costs while helping communities comply with their commitments and obligations under the federal Clean Air Act. For the first time, we adopted a locomotive fuel-efficiency goal, setting a 2020 target to reduce diesel consumption equal to $80 million annually. Achieving that goal will help us meet another key objective – lowering greenhouse gas emissions from locomotive operations, our biggest environmental impact. To reduce that impact, we are investing in engine-handling technologies, an innovative locomotive rebuild program, and network efficiencies that in turn reduce our bottom-line expenses. Norfolk Southern also made gains in social performance in 2015. Workplace injuries declined as we introduced a new safety theme, “i am Coming Home,” that makes safety personal. For the second consecutive year, we hired record numbers of women in our management trainee and conductor trainee programs. Along with that, we formed employee diversity and inclusion councils in each of the company’s 10 operating divisions, recognizing that our future success depends on recruiting a workforce that reflects the diversity of the communities we serve. Since my appointment as CEO in 2015, Norfolk Southern has adopted a five-year strategic plan that further integrates sustainability into business operations. The plan focuses on the three pillars of our business model: safety and service, stewardship of resources through operating efficiencies, and growth. To be sustainable as a business enterprise, we have to deliver on each of these strategic priorities. With a business history approaching two centuries, we realize that meeting the service needs of our customers is the key to longevity. By operating safely, we help ensure a successful future for our customers, our communities, and ourselves. Under our corporate umbrella, we are stewards of many resources: our people, our physical assets, and all the goods and services that we consume as a business. Given the large resource footprint that is characteristic of our company and the rail industry – the tracks, trains, and facilities across our operating territory – it is critical that we remain focused on being a conscientious caretaker of those resources. Norfolk Southern traces its roots to a small railroad in South Carolina that began operating in the 1830s, the earliest days of railroading. Now, as we embrace the challenges and opportunities of a 21st century global marketplace, we are committed to achieving industry leadership in sustainability. We want to be a good steward of the environment and drive our business forward at the same time, a formula that spells success for us and for our key stakeholders – investors, customers, employees, communities, suppliers, industry partners, and government agencies. At Norfolk Southern, that’s what we call efficiency.